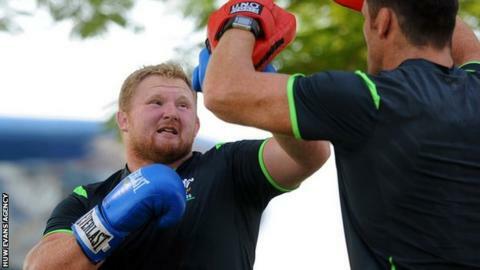 Wales prop Samson Lee has quit his ferreting for rabbits to help ensure he remains fit for the World Cup. Lee will start Wales' opening match against Uruguay at the Millennium Stadium on Sunday, his first game since rupturing an Achilles in the Six Nations against Ireland in March. "The last thing I want is to slip and rupture my Achilles again. I'm trying to keep off it," said 22-year-old Lee. Lee, Aaron Jarvis and Tomas Francis are Wales' main tight-head options. Lee, who has won 12 caps, added: "My first goal was first to get back playing. If I am back playing, then I can get out in the fields and catch a few rabbits." Ex-Wales and British and Irish Lions prop Adam Jones has described Lee as a "once-in-a-generation" tight-head. Wales face tournament hosts England at Twickenham on Saturday, 26 September, before games against Fiji and Australia in Pool A as they bid for a place in the quarter-finals. Lee said he did not follow a set timescale as he tried to regain fitness, instead targeting "goals every week". He added: "It was step by step. I went running, then I got back scrummaging. "Being sidelined gives you a chance to work on other parts of your body - your upper body strength, your neck. "You don't want to lose your neck strength for scrummaging. I was very nervous getting back into it, but with more repetitions I got more confidence." Lee's fellow Scarlet Liam Williams also returns from injury against Uruguay after foot surgery in June. With Leigh Halfpenny ruled out of the tournament by a serious knee injury, Williams is Wales' only specialist full-back. Williams said: "I feel really sorry for Leigh. He's a great player who has been brilliant for Wales over the years." Wales captain Sam Warburton says his red card in the 2011 World Cup semi-final defeat to France feels like &quot;ages ago&quot;. Williams hopes he and friend Jazz Richards, a member of the Wales football team, can both celebrate in October. Chris Coleman's side need only a point from their remaining two Group B games, against Bosnia-Herzegovina and Andorra, to seal a place at Euro 2016. Wales' footballers travel to Bosnia on 10 October, on the day Wales' rugby team face Australia at Twickenham. Williams said: "It would be great if we could beat Australia and perhaps qualify for the quarter-finals, and they could go on to the finals of the Euros."